Why do I want a Public Profile? For Artists (Collector and Organization information below): Your Public Profile is an easy and professional way to showcase your work and share who you are as an artist. It's a great way to gain additional exposure, boost SEO, and is an invaluable asset for any artist looking to grow their business. It’s also linked directly to your inventory, so you never have to worry about separately updating the works on the Profile. It’s available on any device, so you can show your available work to buyers and galleries wherever, whenever. By activating your Public Profile, you also become part of our Discovery network where collectors, buyers and art lovers of all types search for art. Interested buyers can contact you directly through the "Contact the Artist" button and inquire about your artwork. Already have a website? That's ok! 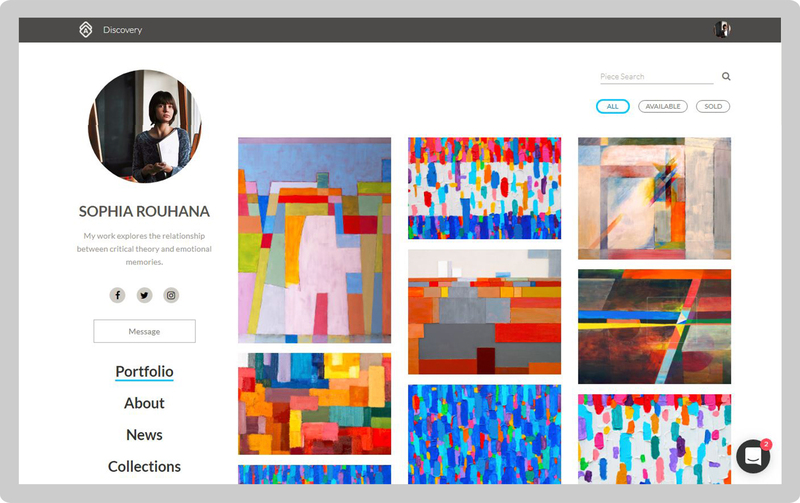 Your Artwork Archive Public Profile works in tandem with your website or online portfolio. Your Public Profile acts as a complement to your existing web presence. In addition to being a great way to expose your work to a new audience, it’s also great for SEO and serves as yet another way to drive traffic towards your own site and social links. For Collectors and Organizations: The Public Profile is an easy way to showcase your collection as well as sharing information about yourself or your organization. If you are looking for a way to gain exposure for the collection you've worked so hard to build, this feature is a simple and elegant way to do so.